This question was asked in another forum. Supplied my response and decided it was a topic that would be fun to blog about. Binge watching is a luxury of the new generation. We had no such thing when I was growing up. But I’m glad we have it now!! My history of being a TV series junkie goes way back. Sunday night was the best night for watching most of my favorite TV shows. “Perry Mason”, the lawyer who never lost a case. “Bonanza”, a western about the life of a widower and his 3 loyal and loving sons. “Mission Impossible”, a team of the coolest secret agents who made the world safe and nobody ever knew because their work was “a secret”. Also liked “Alfred Hitchcock Presents”, mystery/thriller, each episode always introduced by Mr. Hitchcock himself; and “The Twilight Zone”, sci-fi, each episode always introduced by the series creator Rod Serling. Fast forward, I grew up and got married and my husband liked BBC programs. So I got hooked on BBC TV series which aired on our public television station. Really enjoyed the comedies like “Fawlty Towers”. “Midsomer Murders”, all murders taking place in a community of Midsomer County, 20th century time frame (say the 70s and forward). “Murdoch Mysteries” , a Canadian show, set in the 1800s, all cases solved by a handsome detective in the Toronto Constabulary. “Miss Fisher Murder Mysteries”, a lady detective who solves cases in Melbourne, Australia, set in the 1920s. Not only is she smart but she is also quite stylish, a serious fashionista! My binge watching these days are mostly historical K-drama TV series. My husband suggested a romantic comedy, a historical period drama, titled “Tamra the Island”. Loved it!! Watched it so many times, my kids thought I was nuts! That series lit a fire in me and started me watching K-drama TV shows. To avoid repeating myself, just refer to my previous post Watching Korean Drama Online With English Subtitles. * What about you? 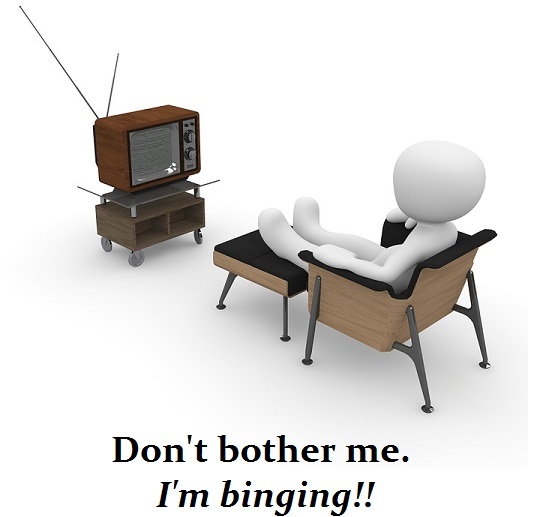 Are you into binge watching? No producers that telecast their programmes on tv would be happy with me as I hardly do justice to their efforts. I have much too much to spare time to spend it in front of the tv. I truly envy you. Oh I’m not really in front of a TV. I’m on my laptop. ( My husband is a TV hogger. 🙂 But he’s a nice TV hogger. 🙂 ) The good thing about is that I can work between two browsers. One browser has my show that I’m watching. The other has my work that I’m doing. The sites I’m using have advertisements. When they break for the ads I can switch over and do some work. I also switch in between because it breaks up the boredom of my daily work routine. If I can remember back in th3 days when we only got to watch tv in the evenings for like two hours then we are told to go to bed by our parents because the following day was a school day. The only time we could watch tv from the afternoon was on the weeknds because there was no school then. When I finsished school I was free to watch tv until midnight so I would watch all the movie that came on and the could only run for a maximum of two hours that was the longest becaus the tv stations used to close at twelve midnight, there was no 24 hour tv station those days. When th3 digital are came by we are now on full swing but the urge of watching tv is not there anymore. There is too much to be done where will the time to watch tv come from when you come home in the evening you ar3 so tired all you want to do is low on your bed an just enjoy the silence after a long days work.so in short I am not a tv binge at all in fact my eyes tire so fast so I can hardly keep up. Watching my favorite TV series? No. But while writing some articles or narrative stories or even news item, I don’t want to be disturb. But its hard to be not disturb especially when you have five hyper active children in your and always playing and shouting, no more binging. I had 11 children. They are all grown now. Binge watching was something I could not do while raising them. But now they are on their own, I can enjoy treating myself to this luxury. I can’t travel or go out much any more. Between finding music on YouTube and binge watching TV shows that are streamed online, I am happy happy happy!